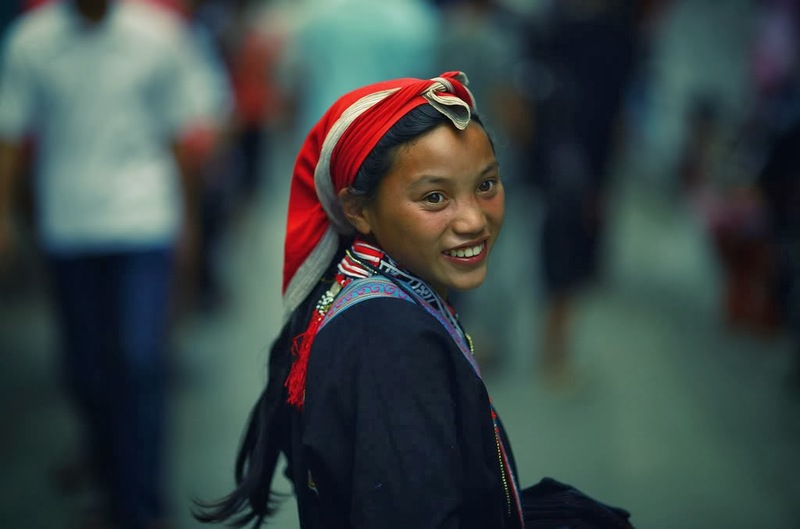 Having a dinner in a spectacular Halong cave, on a pristine beach near Lan Ha Bay, on a private floating platform or sundeck of a Bhaya vesel, is surely one of the most stunning things Bhaya Cruises offers you to personalize your junk cruise through Halong Bay and Cat Ba Island tour. Upon request, we can organize and set up a special dining with a beautiful and romantic decoration. Dining in Halong Bay grotto/cave is definitely an unforgettable experience. Pass through the cave’s mouth and along the candle-lit pathway for the most enchanting of experiences. 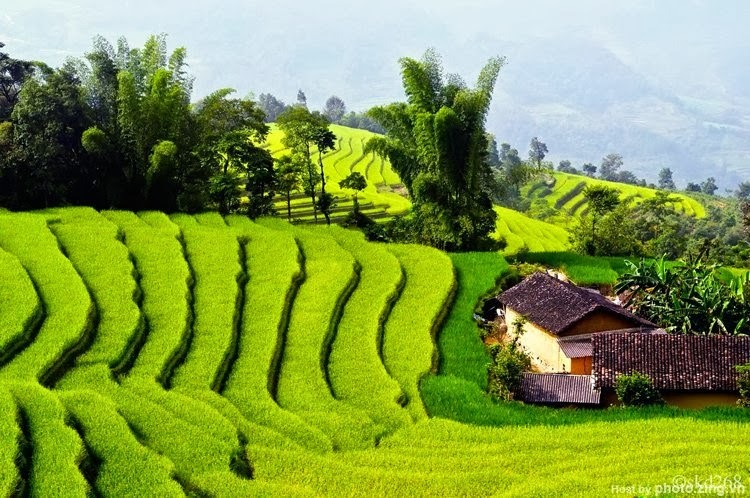 Allow yourself to be bewitched by the mystical scenery inside. 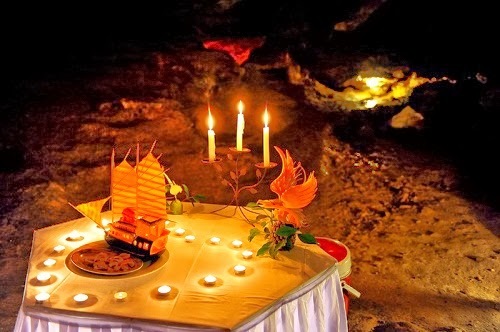 The dinners in Halong Bay grotto/cave we organize will be an amazing experience as much for the delicious and beautifully presented food, as for the romantic setting. Dining in Halong Bay grotto/cave is a wonderful occasion, ideal for a honeymoon, wedding anniversary, birthday, or even a special surprise for your loved one. A dining in grotto/cave is also a favorite service on request to highlight a company retreat, meeting, and corporate event and so on. 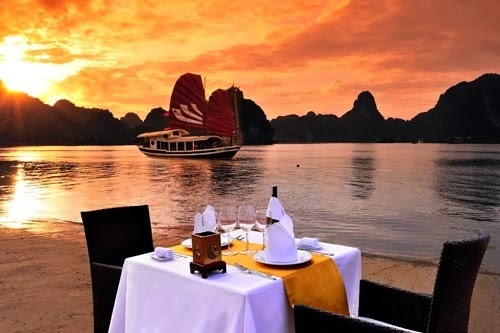 A romantic dinner on Halong Bay beach is always a smart option for you to celebrate a special anniversary such as honeymoon, wedding anniversary and so on. We set up a romantic dinner with delicious food, wine, fresh flowers and candles on a beautiful quiet beach. Other nice option to personalize your cruise is having a dining on the sundeck aboard Bhaya. Dining on board is normally inside our restaurant. Upon on your request, we can set up a dining on the sundeck that can be a party for a company retreat or a special surprise for your honeymoon, wedding anniversary and so on. On the sundeck, while enjoy the delicious food we prepare for you, you will see the panoramic view of Halong Bay with its limestone karts as backdrop. View from the sundeck is breath-taking and constantly changes. Dining on the sundeck offers ideal space and atmosphere to share special moments, to snap great pictures of Halong Bay, to have a refreshing cocktail while gazing at the rock formations reflected in the turquoise waters of the bay and so on. One of the most exciting things we offer you to make your cruise more special is dining on a floating platform on Halong Bay. To have a safe dining on a floating platform, we only use platforms made of those materials that comply with the regulations of the authorities. You will experience Halong Bay in true style dining on a floating platform with decoration upon on request. The delicious foods, the quiet ambient, the constant-changing panoramic view and so on make a dining on a floating platform in Halong Bay an amazing experience.